Traumatic hip dislocations are rare injuries in the paediatric population, requiring urgent reduction to reduce the risk of avascular necrosis but it is common to see in a developing world patients presenting to hospital after months of time after visiting and having massage in a traditional healers. Here I present a 10year old female patient presented to our hospital 86days after sustaining fall down accident from a 4 meter tree. She had been to traditional healer where she has massage but didn’t improve. After arrival to our hospital patient managed by open reduction followed by three weeks skin traction and another three weeks non-weight bearing movement. On follow up she had a good range of movement of the hip with no deformity and leg-length discrepancy. Traumatic hip dislocation in children is rare, only 5% of all hip dislocations occur under 14 years of age . Dislocations in children are classified like in adults, i.e., anterior, central and posterior, with the latter ones being the most frequent ones . Rarely the hip can also dislocate inferiorly . The causes of hip dislocation in children are fall down accidents in 50% of cases, road traffic accidents in 30%, and sports and recreational activities in 15% . Even though this is one of the emergency condition in orthopedics, patients present in developing countries late to a health facility. The definition of old or late dislocation of the hip was not clearly mentioned on literatures but Garret et al  classified patients who were not treated within 72 hours after injury were called as old unreduced dislocation of hip. As the dislocation stays for long time close reduction becomes very difficult and patients need to have an open reduction as one of the best treatment . Here we present a case report on one of the rare type of neglected hip dislocation, inferior hip dislocation, management and its outcome. We report a 10 year old girl presented to our hospital after sustaining a right hip injury following a fall down accident from a four meter tree of 86 days duration. Initially she had severe hip pain with limitation of movement for which she went to a traditional healer where she had manipulation but no improvement. At presentation she had limping and severe deformity at the right hip area. On clinical examination, the right lower extremity was longer by 3cm; the greater trochanter was not well appreciated; all movements were limited at the hip, but no nerve or vascular injury. X-ray finding (Figure. 1) revealed inferiorly and medially displaced right femoral head out of the acetabulum with depression, leading to the diagnosis of neglected obturator hip dislocation. After patient preparation open reduction was done with anterolateral approach to the hip and after reduction the hip was stable with full range of motion. Post reduction X-ray showed concentrically located head of femur in the acetabulum (Figure. 2). In the ward patient was put on skin traction for three weeks followed by three weeks of non weight bearing mobility. Gradually the patient allowed to walk. Follow up after 10 months showed Good range of movement of the hip (Figure.3) and x-ray also showed slight remodeling of the depression with no sign of avascular necrosis (Figure. 4). Figure 2: Postoperative x-ray of pelvic both hip joints. 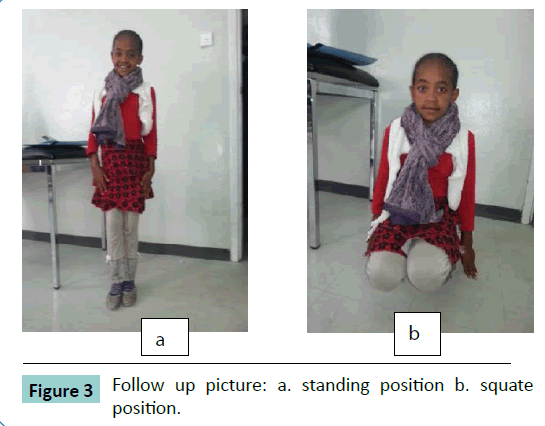 Figure 3: Follow up picture: a. standing position b. squate position. Figure 4: follow up x-ray: a. anterio-posterior view of pelvic b. lateral view of hip joint. Paediatric traumatic hip dislocations are uncommon injuries. Children require less force to dislocate the joint due to a soft pliable acetabulum and ligamentous laxity. The trauma required to produce a hip dislocation in children can range from trivial injury as tripping or fall from same height to severe high impact injury as in motor vehicle accident . As the age of the child increases, hip dislocation is associated with a forceful injury like an athletic injury or a motor vehicle accident. With increasing age, the cartilage to bone ratio diminishes and the periacetabular structures become more rigid. Therefore in older children, trauma leading to hip dislocation tends to be greater [8-10]. The hip can dislocate in to posterior which is the commonest type, central, and anterior. According to Alonso et al  it was 79%, 19%, & 2% respectively and Durakbasa et al  also showed 80%, 13%, & 7% after evaluating 30 cases. In our case the cause of the trauma was a fall down accident from a four meter height tree and it was obturator type of anterior hip dislocation. In neglected obturator hip dislocation patient presents with slightly flexed hip with marked decrease in range of movement of the hip joint and the affected extremity will be longer in comparison to the normal. There are different types of management for this type of hip dislocation, options are closed reduction with skeletal traction, open reduction, hip arthrodesis, and hip arthroplasty . We used open reduction through anterio-lateral approach to hip join and it was easy to access the acetabulum and clear adhesions on the head of the femur from the inferior boarder of the superior pubic rami. There was a depression on the head the femur which is an expected finding because of the continuous pressure on the head by the body through superior pubic rami. The reduction was stable and after closure of the wound on layers patient was put on skin traction for three weeks followed by non-weight bearing for another three week and on the follow up we did not get any difficulty during the rehabilitation as the generally accepted method for younger children is immobilization for 3-4 weeks followed by progressive protected weight-bearing and range of motion exercise. In older children, 2-5 weeks of bed rest with or without traction followed by protected weight-bearing is recommended [8,14,15]. The main short-term concern with strategies that conserve the native femoral head is that the patient will develop avascular necrosis of the femoral head. But study support the theory that patients presenting late following a traumatic hip dislocation can achieve satisfactory outcomes if managed with femoral head conserving strategies, as the femoral head retains its vascular supply in the majority of cases . Other complications which may occur include posttraumatic arthritis, coxa magna, heterotopic ossification, recurrent dislocation, sciatic nerve injury and premature epiphyseal fusion [8,16]. In our follow up patient did not have any one of the above complication and she was walking without any support and returned back to her school. Neglected hip dislocation is one of the rare conditions especially the obturator type of anterior hip dislocation. Patient can be satisfactorily managed by open reduction with anteriolateral approach which gives a good exposure to the acetabulum and the dislocated head. Patient should also be immobilized for six weeks before starting weight bearing. Functional outcome was good with normal limb length and no deformity. Rieger H, Pennig D, Klein W, GrÃnert J (1991) Traumatic dislocation of the hip in young children. Arch Orthop Trauma Surg 110: 114-117. 2.Estrada J, Garza JF(1996)Luxacióntraumática de la cadera en niños. Reportepreliminar de 10 casos. Rev MexOrtopTraum 10: 38-42. Brogdon BG, Woolridge DA (1997) Luxatioerecta of the hip: a critical retrospective. Skeletal Radiol 26: 548-552. Haces F, Legorreta JG, Osuna G (1997)Luxacióntraumática de cadera en niños. Reporte de 10 casos. Rev MexOrtopPed 1: 27-31. Garrett JC, Epstein HC, Harris WH, Harvey JP Jr, Nickel VL (1979) Treatment of unreduced traumatic posterior dislocations of the hip. J Bone Joint Surg Am 61: 2-6. Hamilton PR, Broughton NS (1998) Traumatic hip dislocation in childhood. J PediatrOrthop 18: 691-694. FiguerasColl G, Torrededia Del Rio L, Garcia NuÃo L, Burniol JR, Huguet Carol R (2010) Traumatic hip dislocation in childhood. Hip Int 20: 524-528. 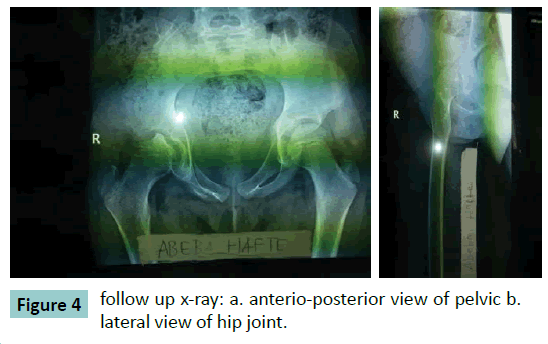 Zrig M, Mnif H, Koubaa M, Abid A (2009) Traumatic hip dislocation in children. ActaOrthopBelg 75: 328-333. Forde JC, Khan KS, Awan N (2009) Traumatic posterior dislocation of the hip in a 3-year-old child.PediatrEmerg Care 25: 584-585. Alonso JE, Volgas DA, Giordano V, Stannard JP (2000) A review of the treatment of hip dislocations associated with acetabular fractures. ClinOrthopRelatRes : 32-43. DurakbaÅŸa O, Okan N, Canbora K, GÃ¶rgeÃ§ M (2005) [Factors affecting the results of treatment in traumatic dislocation of the hip]. ActaOrthopTraumatolTurc 39: 133-141. Vemulapalli KK, Dey C, Peckham T, Paterson JM (2005) Traumatic hip dislocation in a 21-month-old child. Arch Orthop Trauma Surg 125: 490-492. Herrera-Soto JA, Price CT (2009) Traumatic hip dislocations in children and adolescents: pitfalls and complications. J Am AcadOrthopSurg 17: 15-21. Hung NN (2012) Traumatic hip dislocation in children. J PediatrOrthop B 21: 542-551.